The roots of the Regiment originate with the clashes with Arab slave traders and warlike native tribes, which compelled the African Lakes Corporation to employ armed natives, under British officers, to protect their stations. It was a Captain F D Lugard (Norfolk Regt.) who, in 1888, volunteered to lead a military expedition against the slave trader Mlozi. Nyasaland became a Protectorate in 1889 and the Government formed what was to become 1st Battalion, The Central African Rifles (CAR). A second Battalion was formed and sent to Mauritius, and then on to Somaliland to operate against the Mullah. Lugard later became Governor of Uganda. CAR Battalion was sent to Ashanti in the Gold Coast in the June of 1900 where they distinguished themselves in action, and several companies were sent to the Gambia. Detachments from both Battalions came to England where King Edward VII presented medals for the Ashanti and Gambia campaigns. At about the same time the East African Rifles (EAR) was formed to support the civil powers of the new British East African Protectorate. Lugard formed a similar force in Uganda, which, in 1894, after the declaration of The Uganda Protectorate, became The Uganda Rifles (UR). Finally, on 1st January, 1902, all these various Battalions were amalgamated into a new regiment, to be known as: THE KING’S AFRICAN RIFLES. There were to be six Battalions: 1st and 2nd Nyasaland, 4th Uganda, 3rd and 5th Kenya, and 6th Somaliland. The first and longest campaign fought by the new Regiment, KAR, was in Somaliland from 1900 to 1920 against Seyed Mohamed Abdullahi Hassan, the “Mad Mullah”. The Mullah’s revolt threatened the stability of the whole Somali region. All the KAR Battalions (except 4 KAR) were involved. The 1914-18 war was fought in German East Africa, now Tanzania, and the enemy did not lay down their arms until November, 1918. By the end of the war the KAR strength had risen to 22 Battalions. This included a “new” 6 KAR formed from the ex-German askari of the Schutztruppen. The total strength of the KAR was 35,500, of whom 11% were European. Casualties were 8225, including 22.6% of the officers. The total troops involved were 114,000, with casualties of 62,000. There were between 400,000 and 500,000 native porters – The Carrier Corps, of whom 40,000 were unaccounted for at the end of the campaign. Regimental Colours were awarded to the four senior Battalions in 1923. King George VI, and Queen Elizabeth II. Between the two World Wars, though substantial economies of men and materials were made, organisational changes meant that at the outbreak of the 1939 conflict, the Regiment was in a good position to defend the northern borders of East Africa from invasion. Other arms of the military were developed, particularly Signals, but also Artillery, Ordnance, Engineers, REME, Transport, Education and Medical. The first active campaign was that fought against the Italians in Somaliland and Abyssinia. After a short period of defensive action when the Italians invaded Northern Kenya, in February 1941 the 11th and 12th African Divisions attacked northward into Somaliland and Abyssinia. They advanced at great speed, and after much hard fighting and exhausting pursuits of the enemy completed the campaign by July in the same year. Two Victoria Crosses and many other gallantry medals were awarded during the campaign. The second campaing joined by the KAR was the invasion of Madagascar in 1942. The island was held by the Vichy French, and was the key to the safety of the Indian Ocean. Had the Japanese been able to use the island as a submarine base, the consequences to Allied shipping from the Cape to the Middle East would have been most serious. As it was, Madagascar was taken in six weeks, at the end of which a detchment of 6 KAR broke the record of a forced march by covering 80 miles in 21 hours, a record which held for many years. The detachment was commanded by Major General (then Captain) Rowley “Toto” Mans, immediate Past President of the KAR & EAF Association. General Mans died in 2002. Towards the end of 1943, the East African Scouts joined 81 West African Division in Burma and went into action in the Kaladan Valley. The 11th East African Division which had moved to Ceylon in February 1944, joined XIV Army at Imphal in July. The Division fought its way down the great river system of Burma, 25 Brigade advancing through the height of the monsoon to cross the Chidwin. 26 Brigade struck down the Kabaw Valley; 21 Brigade played a major part in forcing the Japanese to abandon the gateway to Mandalay. 22 Brigade suffered heavy battle casualties on the exposed right flank of 2 Corps. The Division returned to East Africa at the end of 1945. By the end of the war there were 44 KAR Battalions. 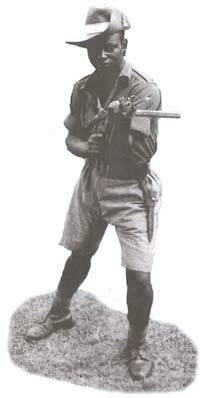 In 1951 1 KAR in Lusaka and 3 KAR in Nanyuki were alerted to move to Malaya for action against the Malayan Races Liberation Army, a communist force mainly made up of Straits Chinese insurgents attempting to take over the country. 1952 saw 1 KAR in Bentong and 3 KAR in Triang. 3 KAR later moved to Kuantan. They stayed until 1953. In 1953 3 KAR was relieved by 2 KAR and 1 KAR returned to Central Africa. 1954 2 KAR was relieved by 1 NRR. 1955 1 NRR was relieved by 1 RAR who stayed until 1956 before returning to Southern Rhodesia. After serious outbreaks of disorder among the Kikuyu tribe of Kenya, a State of Emergency was declared by the Governor on 29th September, 1952. Once again the KAR was heavily involved in operations against Mau Mau. The campaign involved five KAR Battalions, including 23 KAR which had only been formed in 1951 as a second line to 3 KAR which was leaving Kenya (the first time African troops had served outside Africa in peace time) for Malaya with 1 KAR, and which distinguished itself notably in operations, gaining the honour of the award of Regimental Colours in 1956. 26 KAR was formed during the Mau Mau period. Also engaged were two British Brigades, The Kenya Regiment, 21,000 Police and 250,000 loyal Kikuyu Guard. The Army was on active service for four years in the operational areas. The few years that followed the end of Mau Mau insurrection saw the coming of Independence to the East African Colonies and Protectorates, and with this, the eventual disbandment of the King’s African Rifles. During its existence, it had fought with honour in many and varied theatres of operation; many of its European officers and African askari were killed or injured, and many received bravery awards.